Set the table and pour yourself a glass. 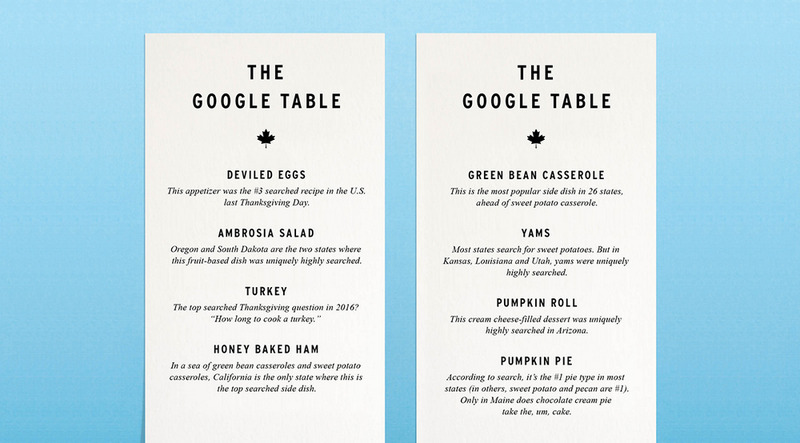 It’s time to talk about your top Thanksgiving recipes and questions according to Google Search. Though it might not be as subject to debate as some conversations you have at your family table, there’s plenty of variety when it comes to our national menus this holiday. Everyone has a strategy for saving maximum stomach space for mashed potatoes, gravy and stuffing on Turkey Day. But while the turkey roasts and the drinks are served, you might be in need of a snack. Enter deviled eggs, the #3 searched recipe in the U.S. last Thanksgiving Day. If you’re in Ohio, you might go a bit bigger with a seven-layer salad. This fruit-based dish is uniquely highly searched in the Buckeye state. Turkey, of course, is the centerpiece dish on most Thanksgiving tables: The answer to one of your top searched questions, “How many turkeys are consumed on Thanksgiving?” is somewhere around 45 million. Now it’s just a question of how to do it. On Thanksgiving Day last year, the top searched Thanksgiving question was “How long to cook a turkey?” The answer depends in part on how you do it; although roasting is common, there were more questions about brining and smoking on the day preceding Thanksgiving. And as the clock ticks by on the day itself, people may find themselves looking for a faster method. That’s when questions like “How long to fry a turkey” and “How to deep fry a turkey” creep into the top 10 searches. And it may be controversial to suggest a turkey-free table, but if anyone’s doing it might be Californians. Excluding turkey, the top searched Thanksgiving recipe in every state is either green bean casserole or sweet potato casserole—except in the Golden State, where it’s honey baked ham. Nobody puts side dishes in the corner. But let’s be real. Most of us are in it for the sides. Many households are breaking out the fried onions and marshmallows to make green bean casserole—the most popular side dish in 26 states—and sweet potato casserole, respectively. But there’s a huge variety when it comes to side dishes, which you can see when looking at the dishes that are uniquely highly searched across states. Examples of these dishes include mac and cheese in Tennessee, collard greens in Maryland and acorn squash in New York. Corn is popular in many places and many forms—casserole in Iowa, pudding in North Carolina and Virginia, and souffle in Florida. Kentucky, Texas and West Virginia are eating their greens, with broccoli casserole, broccoli rice casserole and broccoli salad, respectively. In Oregon and South Dakota, you might find ambrosia salad on your plate. Sometimes there may be just a difference in vocabulary. Though sweet potatoes are popular across states, in Kansas, Louisiana and Utah, yams were uniquely highly searched. You know what they say: I yam therefore I yam. Pumpkin spice everything! 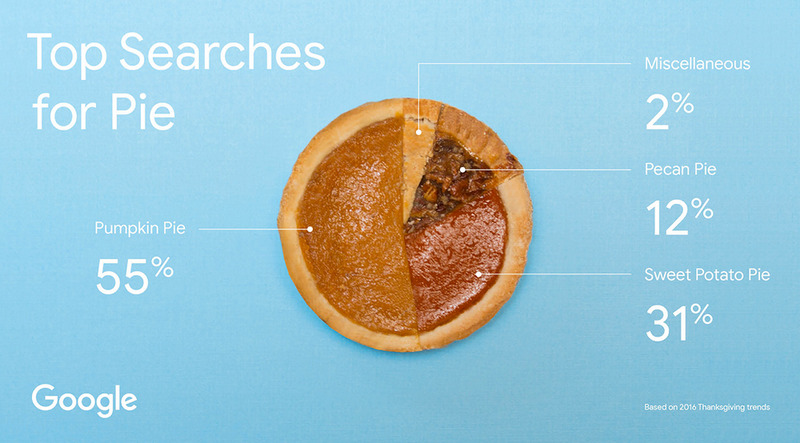 Pumpkin is the most searched pie type in nearly 30 states, followed by sweet potato and, in a distant third, pecan. There’s one true outlier: in Maine, chocolate cream pie takes the, um, cake. But no one has just one pie on their table, right? (Right?) Across states, there’s more variety in the #2 and #3 searched pies, including apple, banana cream and even buttermilk and peanut butter. And pie might not be the apple of some states’ eye. In Arizona, the most uniquely highly searched dish is actually pumpkin roll, a cream-cheese filled dessert. Top questions and most popular searches are based on data from 2016. Unique searches are based on aggregated data from 2015, 2016 and 2017 (so far).